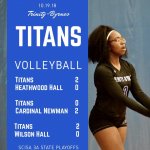 Trinity-Byrnes Lady Titan volleyball was represented on Saturday at the 3A North/South All-Star volleyball match held at Wilson Hall in Sumter. 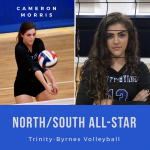 Cameron Morris was honored with a selection and helped lead her South team to a 3-0 sweep of the North. Great job, Cameron! 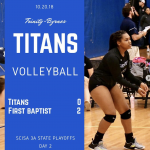 10.20.18 – The Trinity-Byrnes volleyball team moved into Day 2 of the State Playoffs against First Baptist, needing a win to stay in contention. 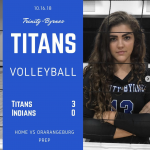 The Lady Titans battled hard, but came up short against the Hurricanes and lost 0-2 (16-25, 17-25). 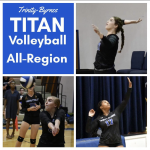 Congratulations to Taylor Cunningham (Sr), Cameron Morris (Jr) and Ragan Swartz (Sr) of Trinity-Byrnes Varsity volleyball for making the Region II-AAA All-Region team! 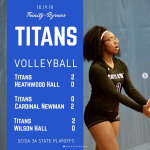 They lead the Lady Titans against Heathwood Hall in the State Playoffs on Friday. 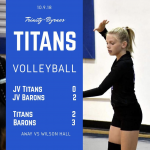 10.9.18 – Trinity-Byrnes JV & Varsity volleyball playing in Sumter vs Wilson Hall. The JV Lady Titans dropped a tough first match 0-2 (16-25, 25-27). The Varsity also lost a tight one 2-3 (27-25, 25-27, 25-17, 22-25, 15-11). 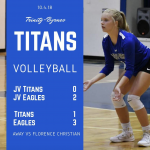 10.4.18 – Trinity-Byrnes JV & Varsity volleyball played at Florence Christian this afternoon. 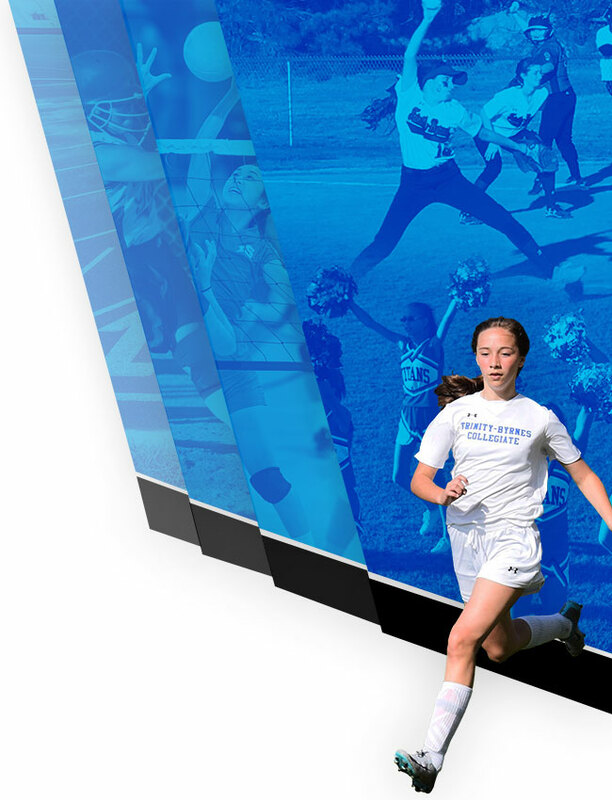 The JV Lady Titans lost to the Eagles 0-2. Varsity dropped a tough one too, 1-3 (16-25, 18-25, 26-24, 25-21). 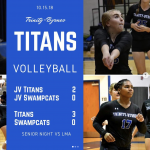 9.25.18 – Trinity-Byrnes JV and Varsity volleyball travelled to the Swamp today, to take on Laurence Manning. The JV fell 0-2 in two very close games. The Varsity was up next and ended up sweeping the Lady Swampcats 3-0 (25-22, 25-8, 25-18). 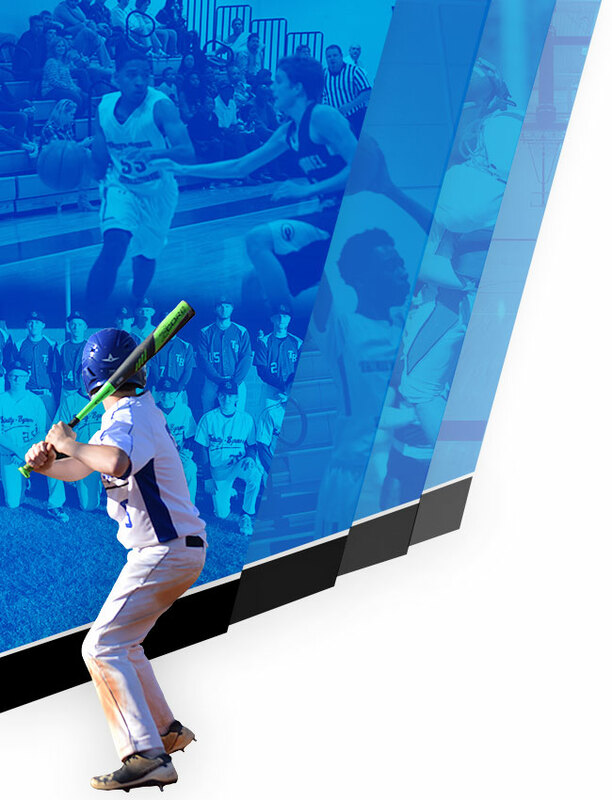 Both teams will take on Orangeburg Prep at HOME on Thursday.